Hello lovelies! 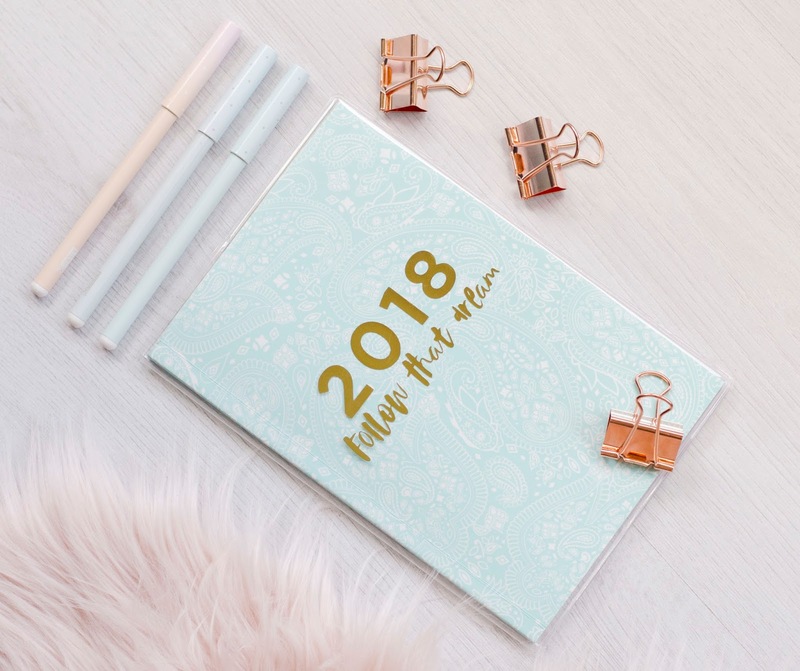 I've recently come back to blogging after taking a pretty long break from it and I have to tell you I feel super great at the moment and excited about sharing new posts with you! I am very passionate about skin related topics as my skin is something I have struggled with since high school. 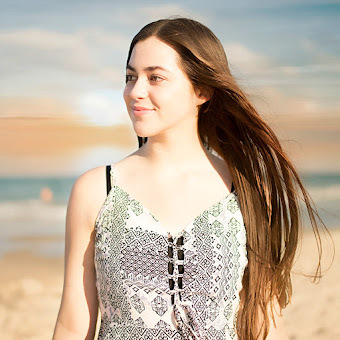 I think that I may share a whole post dedicated to my skin experience but because it's quite long I'll skip over it in this post. I'll just mention that I have combination skin with cystic and hormonal breakouts. I unfortunately do have scarring including some pitted scars on my forehead (I've started skin needling treatments so I'll share my experience with that too) and at the current moment, my skin is quite dehydrated. I do drink more than enough water every day but I haven't found any topical products that actually hydrate my skin well. I thought I would try a couple of the Garnier tissue masks as I've read many positive reviews on them. 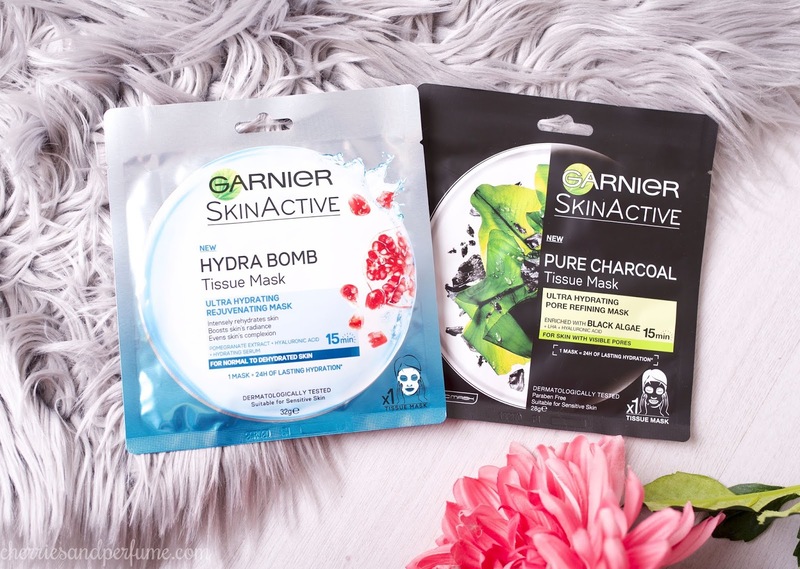 Initially, I intended to buy two different tissue masks from their Hydra Bomb range but ended up getting one Hydra Bomb and one from their new Pure Charcoal range. 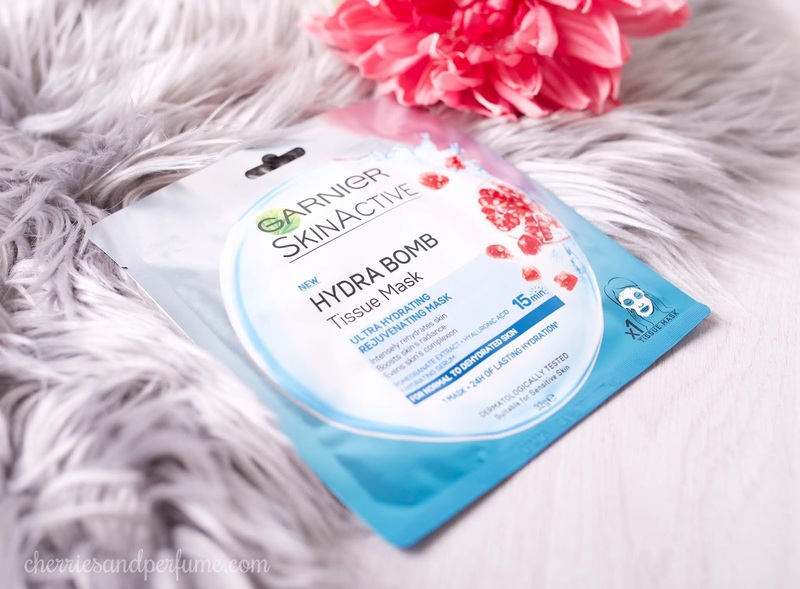 I actually had tried their Hydra Bomb Ultra Hydrating Rebalancing tissue mask, which is their green one, but I don't remember liking it that much. 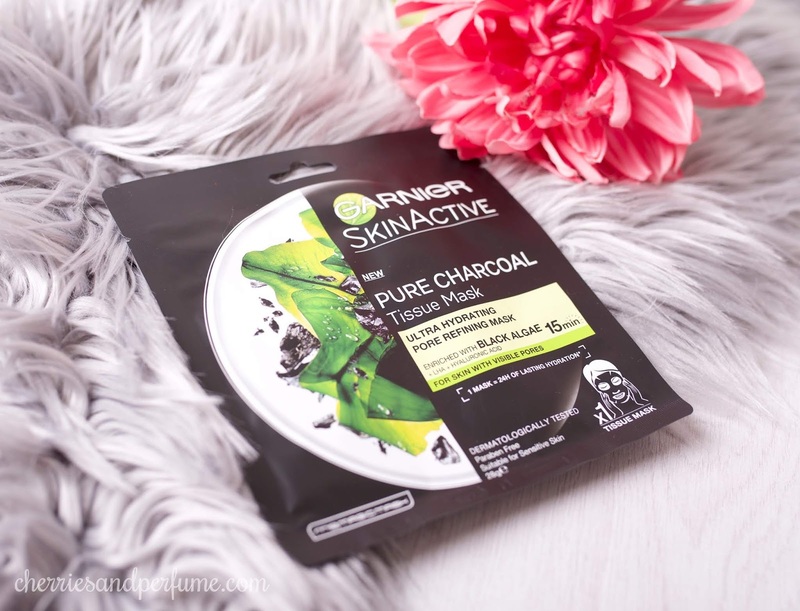 So this time I decided to try the Ultra Hydrating Rejuvenating mask and the Pure Charcoal with Black Algae mask. The first of the two that I tried was the Pure Charcoal with Black Algae. The little slits on the edge of the packet made it easy to tear open without any mess. When I took out the mask I didn't particularly like the scent but it wasn't too strong so it didn't bother me that much. I found the actual mask a little fiddly to unfold but nothing too difficult. When I applied the sheet to my face (cleanse and pat dry first) my skin felt super cool and fresh. The sheet openings for the eyes, nose and lips were easy to shift so it sat well on my face. After a couple of minutes, I did notice a tingling sensation that continued to increase for around 10-15 minutes. The tingling wasn't unbearable but it wasn't pleasant either. Normally you're supposed to leave it on for 15 minutes but I just left it on for around half an hour while I was doing other things. After the 15-ish minutes, the tingling started to subside. After peeling the mask off my skin was definitely cooler. The instructions state that you can either massage the remaining excess into the skin or wipe off with a cotton pad. I decided to massage the rest into my skin to hopefully wake up with nicer skin. This mask claims to extract oil, dirt and impurities from the skin and to refine pores, skin texture and moisturise. I did feel like my skin improved slightly in terms of oil and dirt but my skin does not feel particularly moisturised. For $4.99 it was a nice mask but I think I'll continue to try other products. Good news is it didn't have any negative effects and my skin did appear to be less red! I decided to purchase the Ultra Hydrating Rejuvenating mask because like I mentioned, my skin has been feeling quite dehydrated even though I drink more than enough water. I find that when my skin is dehydrated, makeup will look far too dry and powdery on my skin and that's not exactly the look I want. It doesn't matter how much I prep my skin, or how dewy/ glowy the products I'm using are, it still looks oddly dry. I could be prepping my skin the exact same way and using the exact same products and sometimes it looks lovely and other times not so much. Hence I am now focusing on rehydrating my skin, and according to many online reviews, this is a good product for that. The packaging is the same, easy to tear open. This mask, however, has a blue protective layer that you peel off after applying the mask to your skin (blue side facing out). When I first applied the mask to my skin it felt fresh and cool just like the first mask. But for some reason, I found this one more fiddly. What I liked about this mask is that there was no tingling sensation so it was far more relaxing and enjoyable to have on my skin. Again, I did leave this on for longer than the recommended 15 minutes as I do with most masks. After peeling off the mask I massaged the remaining serum into my skin and let it do its thing. I do feel like my skin is more nourished and maybe after multiple uses (these are single-use masks so I'd be repurchasing new ones), I may notice a pretty good difference in my skin. I much prefer the Ultra Hydrating Rejuvenating mask (blue one) over the Ultra Hydrating Rebalancing mask (green one) I tried a long time ago. This one is also my favourite out of the two I mentioned in this post. Have you tried these Garnier tissue masks? I'd also love to know what your favourite hydrating skin products are.